You can now read my Creole Creamery story here. It's the dead of summer, which means it's time again for me to write an ice cream story. Last summer I wrote about an album of ice cream truck songs and took my initial stance that ice cream should be one word. Wouldn't the world be simpler if we all ate icecream? Alas, not much progress to report on that front. This season I've written a story about Creole Creamery, my favorite around-the-corner caloric haven, for New Orleans' new Second Line News. The shop's flavors, from Red Velvet Cake to Creole Cream Cheese to Pop Rouge (see article), tell the story of New Orleans' culinary history. Though I've yet to see a roux-flavored ice cream in their dairy case, I wouldn't be at all surprised if one was in the works. When I placed my first order at Creole Creamery last September, I knew the shop was going to become an important culinary spot for me, for simple pleasures and moments yet unimagined. It's neither a chain (no watery ice cream of my youth here! 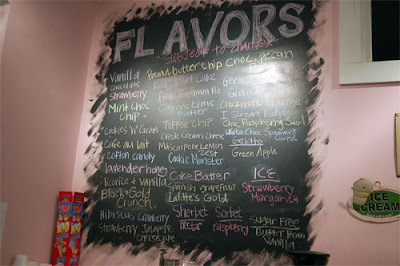 ), nor is it pretentious -- it's just a shop that genuinely wants to serve great ice cream at a fair price. By doing exactly that, it captures the magic of childhood (Cotton Candy or Bubble Bear ice cream), the pleasures of adulthood (Butterscotch Bourbon or Wedding Cake Champagne ice cream), and the joy of sharing good food (I enjoy flavors from both age groups), all in one scoop. Here are some choice quotes and interesting bits from my interview with owner David Bergeron that didn't make it into the story. ~“Peppermint is our most requested flavor and our most difficult to make because we have to individually smash wrapped peppermints with a hammer.” Apparently the soft kind that they like to use only comes individually wrapped. ~On the recent cinnamon and bacon flavor, “That’s one of those flavors that 95% of the people don’t like and some of them are offended that we’d make it, but the 5% who do like it are really enthusiastic.” This flavor reminds me of Vosges Chocolate's phenomenal milk chocolate bar with Alder wood smoked salt and pieces of applewood-smoked bacon. ~Bergeron tells the story of a less popular flavor with lemon, basil, garlic, and butter. When it didn’t sell well, they put it in the back freezer but one customer kept coming for it. Finally they asked her what she was doing with it, and it turned out she was taking it home, reducing it on the stove, and serving it over pasta! ~"There's a whole group of people who don't even know what they [classic New Orleans flavors like Pop Rouge and Nectar] are anymore and it's up to me to educate the masses," he jokes. To me, his words are the gospel. Try taking the Chipotle in Adobo (in a can) and puree it into a paste. Use that paste like you would tomato paste to flavor rice, guacamole, enchilada sauce, etc. It is very useful and lasts a long time if in a sealed container in the refrigerator. Thanks, that's a great tip. If or when you come to Atlanta for more than an hour, we should go to Sugo. They have great food and wonderful desserts! I like La Bomba: chocolate and vanilla swirled gelato encased in a dark chocolate shell.